When it comes to teethers, not all are created equal. Sometimes your little one just needs a soothing, soft surface and other times, they want something a bit more interactive. 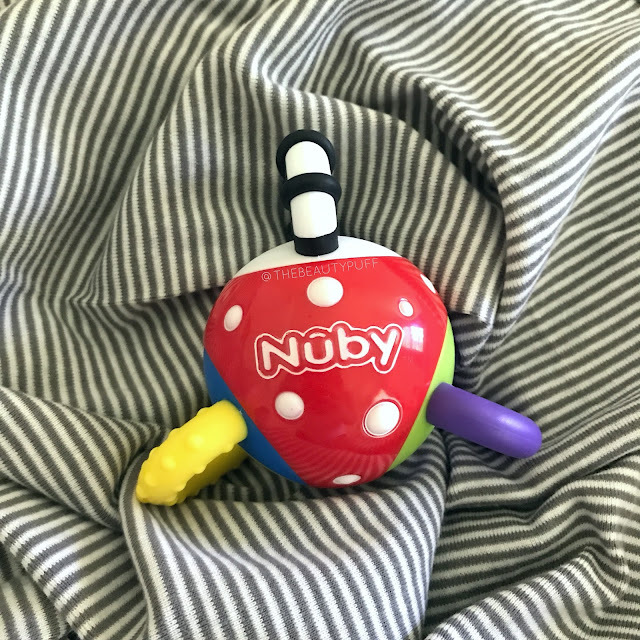 The Nuby Twista Ball Teether combines different chewing surfaces and different sounds to keep your little one busy while helping soothe their gums at the same time. The Nuby Twista Ball is a unique design that incorporates three rotating rings surrounding a ball at the center. As the rings twist, they click so it provides entertainment at the same time. The center of the ball also rattles so baby can shake it while easily gripping the outer rings. It's a great design to aid in hand-eye coordination as baby grows. Each outer ring features a different color and texture. The purple ring is smooth, the black and white ring has a soft, ribbed surface, and the yellow ring has little "nubs" that help massage gums to help incoming teeth. With three different surfaces, your little one can find what feels best for them. And as with other Nuby teether's, it's easy to wash and disinfect between uses. With twins on the way, we've got to have options! This teether will be a great addition to our collection for my little ones. I love how interactive and vibrant it is. I definitely see this becoming a favorite. You can shop the Nuby Twista Ball Teether below on Amazon.com!